A Good Time in Radstock is the project to update and refurbish the Market Hall clock and restore its hour strike that has been silent for many years. The Market Hall has been a central and prominent feature of Radstock for nearly 120 years and the clock has become a symbol of Radstock, featuring prominently on the new road signs, and along with the old mining headgear is an integral part of Radstock’s town centre. In Queen Victoria’s Diamond Jubilee year of 1897, there was a ‘vocal section of the public clamouring for a town clock’. George Coombs, who initiated the building of the Market Hall in 1898, listened to that cry; and the clock was installed in the new building by F.S. Lane (Frank Lane) a Radstock based jeweller. To start with, the clock dials were illuminated by gas light. After 1910 the gas lighting was paid for by the Urban District Council in return for the public use of the lavatories in the Market Hall, there being no other public conveniences in Radstock at that time. The gas lights were converted to electricity in 1932 but, by 2015, this system was no longer functional and the dials were no longer illuminated. Sadly the hour strike has been silent for many years. When the Market Hall was converted into a Museum just before the turn of the millennium Terry Taylor of Paulton, a highly experienced horologist, carried out a complete clean and refurbishment of the clock, but time has marched on and the clock is overdue for an overhaul. As a contribution to the regeneration of central Radstock, and to restore pride in our town’s historic character, Radstock Museum, as custodian of the Market Hall, intends to bring the clock back into full operation as an accurate timekeeper, with automatic winding, with an illuminated dial and with the chime fully functional, but silenced at night! 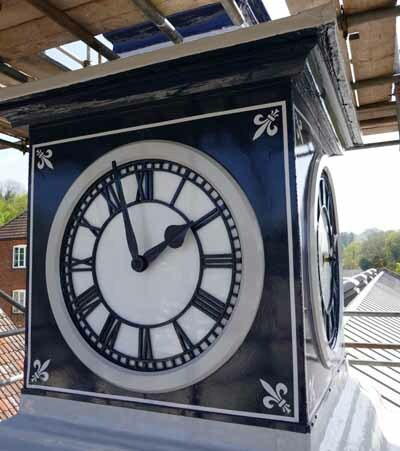 It is estimated that the total cost of the clock restoration and upgrade is slightly more than £11,000. The project is being done in phases and each phase will start as soon as sufficient funds have been raised for it. The restoration will be managed by Radstock Museum and carried out by Symon Boyd of Timsbury Clocks and with advice from Terry Taylor. In mid-November 2015, at the Dragons’ Den event run by Big Local: Radstock & Westfield, the Museum made a successful pitch for financial support from Local Trust for the Big Lottery Fund. “A Good Time in Radstock”, was awarded £500 to kick start the fundraising campaign for the clock’s restoration. Thanks to this grant we have restored the Clock Dial illumination. St Peter’s Church, Camerton made a major contribution through a fund raising organ recital. We have received several public donations the most significant of which was from Australia in memory of a loved one from this area. The Museum held a fund raising Quiz in the Radstock Hotel at the end of Nov 2016 that raised the total funds to over £2500. 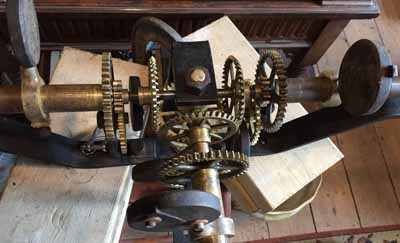 In April 2017 Norton Scaffolding erected the scaffolding needed to get to the top of the clock tower and Symon Boyd from Timsbury Clocks removed the hands, the hand drive mechanisms, the bell, the hammer return spring and the strike mechanism and took all the pieces requiring restoration to his workshop. He found that apart from needing a very good clean up, the strike return spring needed replacing, one of the two trunnions on the bell strike shaft had sheared off and the bearings had suffered some minor damage. On May 2nd Symon re-installed the bell and the repaired hammer mechanism with a new spring which was made for us by the J.R. Goold Vintage Steam Restorations Ltd at their works in Camerton. Although the clock motion and hands were not at that time in place the strike mechanism was recommissioned and for the first time in many years the clock struck the hours! At the same time as this was going on, one of our volunteers, Bob Taylor, was working on the tower paintwork and sorting out the leak which had been causing water ingress into the new Research Room below the clock tower. After a spring clean of the inside of the tower by Jos Binns, Symon Boyd replaced the overhauled motion and the clock hands. And finally on May 9th the motion was reconnected to the clock movement and the hands starting telling the time again. The scaffolding came down in June. Many thanks to everyone who contributed to this great acheivement by carrying out the work, by giving grants and donations or by supporting the fund raising process. We now start the next phase which is to raise the money to overhaul, protect and modernise the movement. Your support will be greatly appreciated and if you want to donate to the project please go to the DONATE page of this website. We intend to keep everyone in Radstock informed about our fund-raising success for the project with regular updates in the local press. You can also sign up to receive regular news by e mail of what is happening on this project and in the Museum itself. Sign up for the Museum Newsletter.